0 Cut the chessboard sides, front and back pieces to size from i^-in.-thick walnut. Kip stock for all four parts to in. wide. Crosscut the parts to length on the table saw with the blade set to a 45° angle (See Photo A). This way, your crosscuts will also form the miters on the ends of the parts. © Lay out and cut the drawer faces from the front and back work pieces: Use the dimensions shown in the Detail: Front & Back drawing on page 281 to draw your cutting lines. Drill tiny starter holes at all four corners of each drawer face. 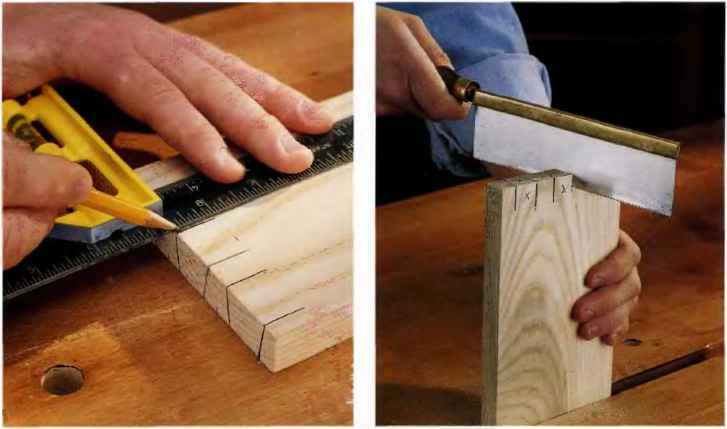 Cut out the drawer faces with a scroll saw and the narrowest fine-tooth blade you have, keeping your cuts as straight as possible (See Photo B). The goal here is to produce drawer faces that are about Vie-in. smaller all around than the openings Into which they fit. This way, once the drawers are assembled and installed, the grain pattern w ill match across the front and back of the chessboard. PHOTO A: Crosscut the front, back and side pieces to length on the table saw with the blade tilted to 45°. Since all four parts are the same length, you can use the saw fence as an index to establish the length of the parts, like we show here. Caution: if you use Otis method, the blade must tilt away from the fence, and the waste piece must fall away on the side of the blade opposite the fence. Otherwise, the ivaste piece or the workplace could become trapped between the blade and the fence and result in kickback. PHOTO B: After drilling starter holes at all four corners of both drawer faces, carefully cut out the faces from the front and back workpleces. The faces are cut from the front and beck parts so the wood grain will match when the drawers are dosed. 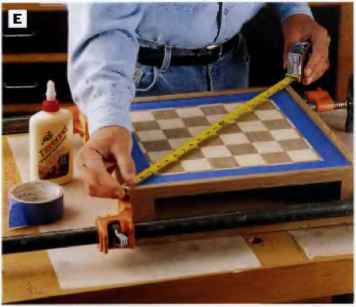 PHOTO C: Lay out and cut the chessboard squares from walnut and maple self-stick veneer. Make 32 of each, using a straightedge and utility knife to cut them out. Hold the blade vertically as you cut so that the edges will be square and fit tightly together. ® Draw a layout grid on the tup panel. Use a pencil and straightedge to divide the top into four equal quadrants. You'll lay out the veneer squares starting from the center, and these layout lines will help keep the veneer aligned. © Cut the 64 veneer squares: Draw 32 squares on both the maple and walnut veneer. Use a steel straightedge and a sharp utility knife to trim the 1%-in. 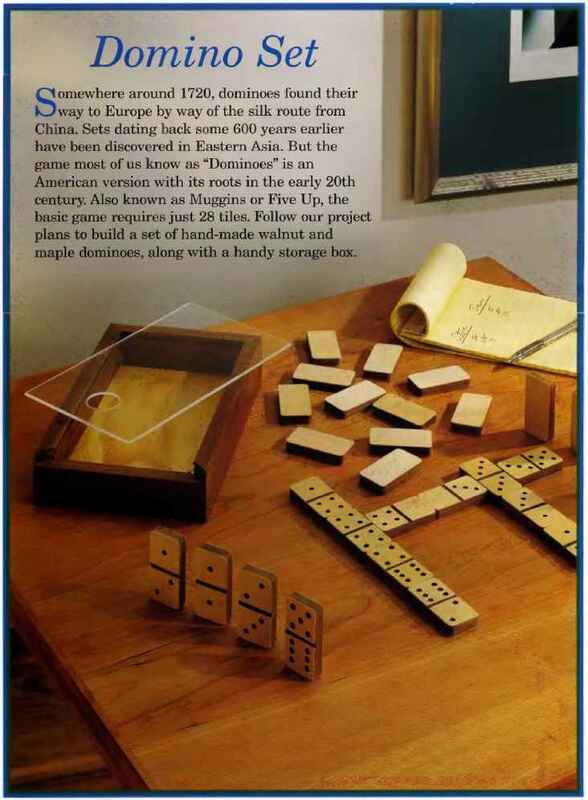 squares to size (See Photo C). Hold the blade vertically as you cut, or the edges of the squares won't mate tightly later. Use one square as a template to check the dimensions of the rest of the squares. PHOTO D: Divide the MDF top panel Into four layout quadrants with a straightedge and pencil. Then begin to install the veneer squares, starting with a group of four at the center. Work outward from the center, in all four directions, fitting the squares as tightly together as you can. Use a J-roller or rolling pin to press the back of each square firmly in place. 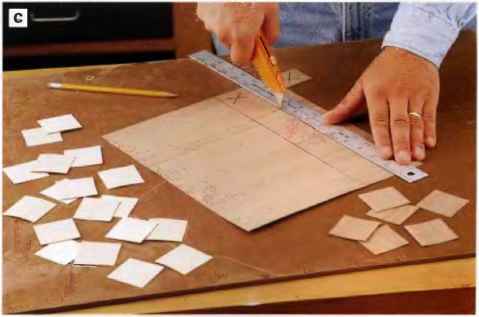 © Lay out and adhere the veneer squares to the top: First, dry-assemble the squares on the top panel to check the fit of the parts. Then install four squares around the centerlines by removing the protective backing paper from each and pressing them into place. Be sure the MDF is free of all traces of dust before you begin, so the veneer will lay perfectly flat. Orient the first four squares in an alternating pattern of maple and walnut. You can either keep the grain running the same direction for all the veneer, or run the maple and veneer grains perpendicular to one another, whichever look you prefer. Then proceed to mount the rest of the squares, working out from the center and using your layout lines as alignment guides (See Photo D). Keep the joints tight between the squares. © Press the veneer squares down firmly. 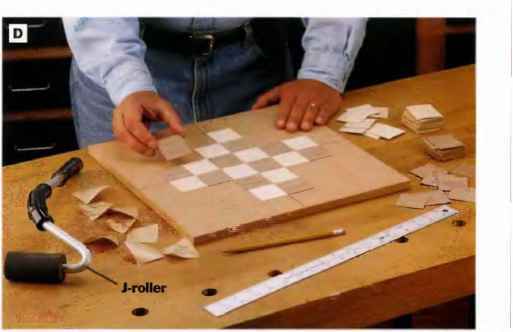 Use a J-roller (a countertop laminating tool) or a kitchen rolling phi to ensure good adhesion of the veneer squares, especially along the edges and corners of each square. When all the squares are in place, give the whole top a light sanding with 400-grit paper installed on a random-orbit sander. Don't use an orbital sander—it will make scratches across the grain. ©Cut the bottom MDF panel for the bottom to size. Be sure its dimensions match the top panel. PHOTO E: Assemble the top and bottom, front, back and sides with #0 biscuits and glue to form the carcase. Project the perimeter of the veneer top from giue squeeze-out with masking tape. Be sure the carcase is square when you damp by measuring the diagonals. When the diagonal measurements match, the carcase Is square. Adjust the clamps, if needed, to adjust for square. PHOTO F: Cut and glue a drawer guide Into the recesses on either side of the drawer openings. 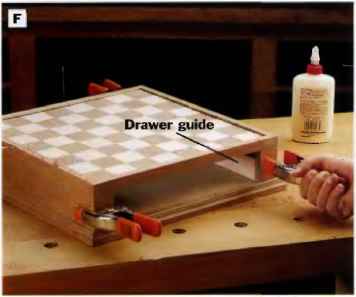 Clamp the guides from both sides of the chessboard while the glue dries. O Dry-assemble the tup, bottom, .sichit,, front and back to check the lit of the parts. Be sure t he chess board grid is oriented correctly: there should be a white square on the right corner above each drawer opening. The miter joints must close tightly. If they don't, sand the edges of the top and bottom panels a little at a time to improve the fit of the miter joints. for locating the approximate positions of the biscuit slots. Notice that you'll cut two slots into each edge of the top and bottom pieces as well as the mating slots in the front, back and side pieces. When you cut the slots, index your biscuit joiner so that the top and bottom panels are flush with the top and bottom edges of the drawer cutouts. You may want to cut a t est slot on scrap to check your joiner's depth-of-cut. setting. © Assemble the carcase: Protect the veneered face of the top panel from glue squeeze-out by covering the perimeter with masking tape. Spread glue along the mating surfaces of the joints and into the biscuit slots, insert, biscultb and clamp up the carcase. Check the assembly for square (See Photo E), and wipe away excess glue. Remove the masking tape after the; glue stops squeezing out and before it dries. © Rout and install the bead molding around the base of the carcase. 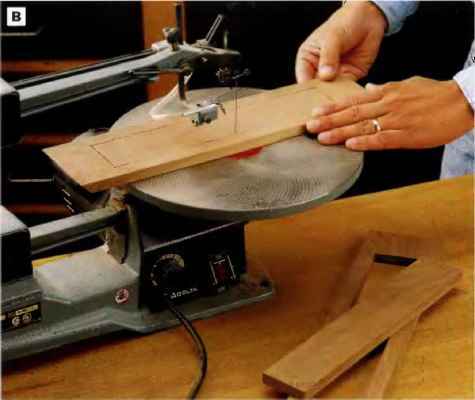 The safest way to mill this narrow molding is to rout the long edge of a length of }A2-in.-thick stock, then trim the profiled edges off the board to form the molding. 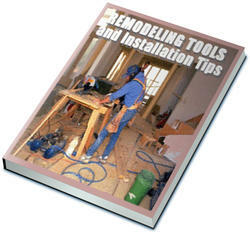 Set up your router table with a Vi-in-radius bead bit, and rout the molding in two passes of increasing depth. Rip-cut. the 'H-in.-tall moldings from the board. Mitcr-cut four strips to length, and attach the molding around the carcase with glue and clamps. ©The first step in building the drawers is to cut a pair of spacers to act as drawer gu ides. These are pim])Iy scrap stock, ripped to width, trimmed to length and glued into the recedes on each side of the drawer openings (See Photo F). Kip them about tie in. narrower than flush so they set back sl ightly from tin; ends of the drawer openings. This will allow a bit of room (or drawer play. © Cut the drawer fronts, backs and sides to size: Rip and crosscut these maple parts on the table saw. 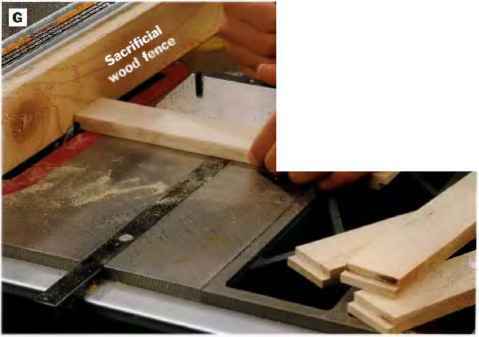 PHOTO G: Attach a sacrificial wood fence to your table saw's rip fence, and use it to establish the Vi x Vi-ln. dado Made reveal for cutting rabbets on the ends of the drawer front and back pieces. Cut the rabbets with the workpieces held against both the miter gauge and the sacrificial fence. fence, forming a Va x Vi-m. rabbet cut setup. 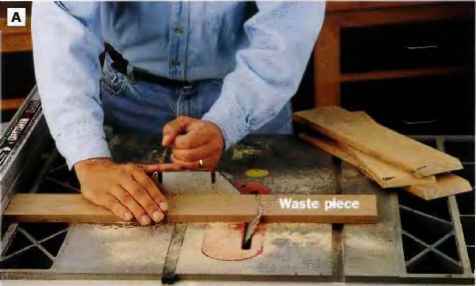 Hold a work piece against the miter gauge and sacrificial fence, then slide the miter gauge over the blade to cut each rabbet (See Photo G). You could also cut these rabbets on the router table with a straight bit. © Cut dadoes into the drawer sides to receive the drawer front and back tongues as well as the drawer bottom. All of the dado cuts are '/4 in. wide and H in. deep. Reset your dado blade and saw fence accordingly to make the tongue dadoes, then the drawer bottom dadoes. © Glue up the drawer boxes. Dry-assemble the parts to check their fit. Then spread glue onto the mating surfaces of the corner joints but not into the drawer bottom dadoes. The drawer bottoms should float freely in their grooves, without glue, to allow for wood movement. Assemble the parts and clamp the drawers. © Attach the walnut drawer faces to the drawer fronts. First, check the fit of the drawer l>oxes in their openings, and sand as needed until the boxes slide easily in and out. Spread glue on the drawer fronts. Set the drawer face against the drawer fronts and align each drawer face on the drawers so the bottom and ends of the drawer face are flush with the bottom and sides of the drawer boxes. Hold the drawer faces in place with spring or C-clamps until the glue dries. © Sand the entire project (except the veneered grid) with 220-grit paper. Use a tack cloth to remove any residual dust, then apply three coats of satin polyurethane varnish. © Install the drawer knobs. Locate the centers of the drawer faces, and drill pilot holes through the faces and drawer fronts for the knob screws. Screw the knobs in place (See Photo H). 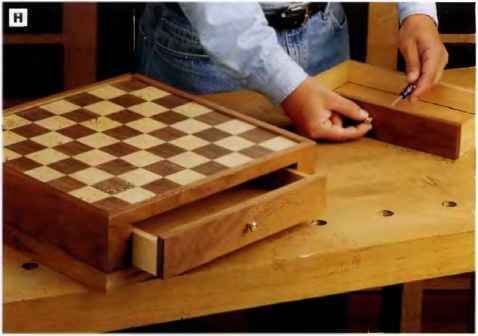 Design note: This chessboard was not designed to be portable or frequently transported, If you are likely to move yours around a lot, be sure to hold both drawers closed as you carry it in order to keep them from sliding out of their openings. Or you may want to add magnetic catches, ball catches or small turn buckles to secure the drawers closed.